The Turkish Football Federation recently completed its latest tender process for broadcasting rights. Turkey’s pay-TV operator Digiturk, now owned by Qatar’s beIN Group, overcame rival platform Turkcell Superonline to acquire the rights to broadcast Turkish league football for a five-year period for $500 million (expected to reach $600 million with tax). The acquisition means that the Turkish Super League retains its position as Europe's sixth biggest league by value of broadcasting rights (see table at the end of this article). The Turkish Football Federation (TFF) regulates Turkish football. Law No. 5894 on the Establishment and Duties of the TFF sets out the principles and procedures regarding the establishment, organisational structure, duties and powers of the TFF. According to Article 13 of Law No. 5894, the TFF Executive Board is exclusively entitled to broadcast all the football matches in Turkey, regardless of the medium. Paragraph 2 of Article 13 grants the TFF power to market broadcasting rights centrally and to distribute the proceeds derived from such rights to Member Clubs in such manner as may be decided by the relevant bodies of the TFF. “Any agreement signed between a club and a broadcasting company shall be subject to the TFF’s supervision and approval. Any such agreement not approved by the TFF shall not be binding on the TFF. No match shall be broadcast on TV, radio, the Internet and all other similar sound and data carriers, unless the required license therefore has been received from the TFF. Consequently, TFF has a legal monopoly status, not only for the technical regulation of football, but also for the economic activities involved. So the legal classification for selling football media rights is sale by a single entity holding exclusive rights rather than a joint selling action. It is noteworthy that the Statutes and the Regulations adopted by the relevant organs of the TFF do not explain exactly how the TFF will exercise such rights, in terms of their scope and duration. All Turkish football clubs are part of a "pool system" (established in 1996), pursuant to which broadcasting income is collected in a “pool” and then distributed to the clubs according to certain rules. The Turkish Union of Clubs (TUC) represents them in this regard. Together, the TFF and TUC have prepared a document pursuant to which the tender process is managed, entitled “General Tender Specification Regarding TFF Super League and TFF First League Media Rights” (“General Tender Specification”). Package D - includes all packages and also all visual and audial rights, extended highlights with an estimated value of $495 million. The estimated values are broken down with each package. All packages grant exclusive rights to its owner and do not have a geographic limitation. This means that the rights holder has exclusive rights over the contents created by itself. However, there are some exception in packages. For example, according to the Article 2.3 of the Package A Contract, the TFF may allow clubs to broadcast their own games on their own club’s television channel up to thre) times during the same season without a fee. Upon TFF approval, clubs may demand their own footage after 24 hours from final whistle of the last game of the week. The most recent tender took place in TFF’s convention hall in November 2016. Five companies obtained the General Tender Specification and were granted the right to join the tender. However, only 2 companies - beIN MEDIA GROUP and Turkcell Superonline - were actually present, as it was understood that beIN MEDIA GROUP where prepared to bid for Package D, which automatically includes the other 3 packages. It was also necessary for bidders to provide a deposit, so one suspects that the three companies that pulled out wanted to avoid further unnecessary costs. Turkcell Superonline (Turkey’s one of the leading internet service provider and GSM company) only made an offer for Package C. Meanwhile, beIN MEDIA GROUP made an offer Package D, with a record-breaking bid of $500 million (plus VAT) annually. With this bid, they won the rights to broadcasti the Turkish Super League and First League. A yearly inflation rate will be applied to the tender fee. Collectively, beIN MEDIA GROUP is going to pay approximately $2,950,000000 (two billion, nine hundred fifty million US dollars) to the Turkish clubs over the course of the next five years for the contract. This is expected to increase Turkish club’s revenues by 50%. At the end of the 2017/18 season, each club that competes in Turkish Super League will receive a $9,150.000 participation bonus. Every club will also receive $670,000 for each win and $335,000 for each draw as performance bonus. The top 5 clubs in the 2017/18 season will also receive extra bonus. The champion will receive $8,900,000, runner-up - $7,120,000; third - $5,340,000); fourth - $3.560.000; and fifth - $1,780,000. Clubs will also receive a bonuses for their past successes. Each past championship win is worth $844,000. Currently, Galatasaray has 20 championship wins, and automatically receives $16.880.000, Fenerbahçe receives $16.036.000 for 19 championships, Beşiktaş receives $12.660.000 for 15 championships, Trabzonspor receives $5.064.000 for 6 championships and finally Bursaspor receives $844.000 for one championship. Last year’s champion, Beşiktaş, received $30 million in broadcasting income. 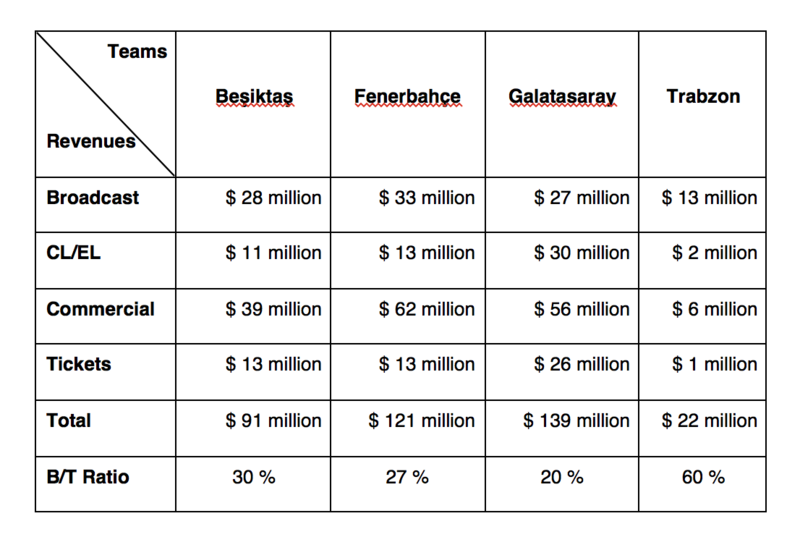 If Beşiktaş achieves championship again this year, it may receive over $40 million (getting on for 10% of total broadcasting income). The system in Turkey is intended to provide more competition within the league, as if the rights are sold collectively the revenues made from this can then be distributed more evenly. 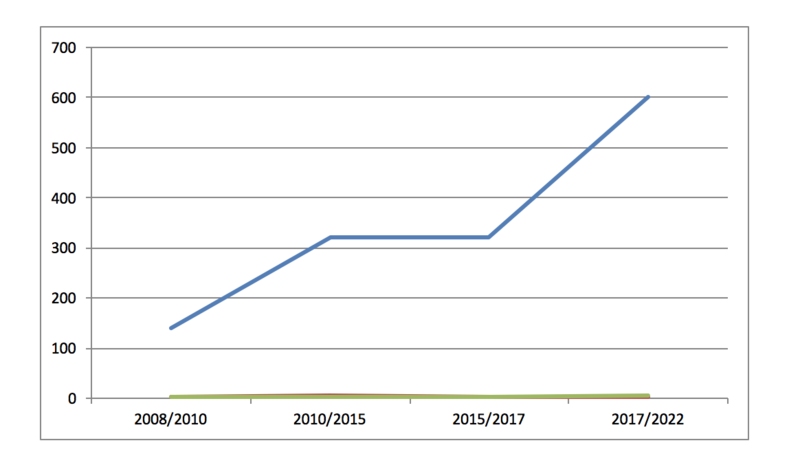 The bigger clubs will still traditionally see more of this revenue as the money is split proportionately depending on where each club finishes in the league table at the end of the season. The bigger clubs in Turkey feel that they should be able to sell the rights to their games individually, as they cannot sometimes compete in the money stakes with their international counterparts when it comes to transfer fees. However, the TFF and TUC feel that this would decrease competition within the league in Turkey as the smaller clubs will stand little chance of competing. This exciting and technology-led brave new media world is undoubtedly having an appreciable effect on the sporting world in general and, in particular, presents further challenges to sports broadcasting rights holders, sports governing bodies, sports persons and teams and other stakeholders, as well as their professional advisors, not least their lawyers. According to the numbers published in the first quarter of 2016 by Information and Communication Technologies Authority, beIN MEDIA GROUP had 3,105,000 (three million one hundred and five thousand) subscribers (most likely higher now). An individual, who wants to watch Turkish Super League, has to pay around $ 20 monthly. With the sponsorship deals and international sales of broadcasts, it seems relatively likely that beIN MEDIA GROUP will recoup it’s investment. Now, beIN MEDIA GROUP has an obligation to broadcast with 4K and UHD production quality. Last year, the company introduced a VR (virtual reality) system, which it will apply to football matches in partnership with Samsung. Moreover, beIN MEDIA GROUP leaked that they make further improvements to quality with developing technology within next year. Interesting and challenging times lie ahead for all those involved in the sports broadcasting field. In this respect, it will be interesting to see how the laws at the national and the international levels develop. Will we see further country initiatives, designed to ensure transparency and efficiency of the broadcasting rights market, while improving the competitive balance among participating clubs? Dichotomy and conflict in the sports law field still continue. In 2015, Turkish Competition Authority has granted immunity to both TFF and beIN Group in order for parties to prolong broadcasting agreement until 2017.